According to data from at least one research firm, T-Mobile’s rebranding as the “Un-carrier” is working and working well. Research firm YouGov found for the first time since it began tracking this type of data one year ago, that smartphone users are more likely to switch to T-Mobile than Verizon. YouGov’s “BrandIndex Buzz score” shows that T-Mobile has surpassed Verizon at least twice in the last four months. Ultimately, part of T-Mobile’s success can be attributed to the idea that Verizon helped the NSA to customer metadata. Still, the idea that T-Mobile maintains a consistent lead over AT&T and Sprint in the YouGov research bodes extremely well for the moves T-Mobile’s execs are making. T-Mobile’s brand perception began to creep up immediately following T-Mobile CEO debuted the company’s new branding in a profanity filled speech last March. T-Mobile’s Buzz score doubled from less than 7 points before the announcement to about 15 points in mid-April when it knocked Verizon off the top spot. 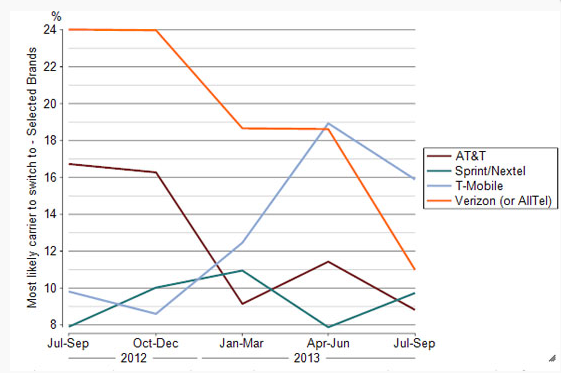 Verizon recovered quickly but nose-dived in June followed the revelation it provided customer information to the NSA. Bad Verizon, bad. Taking it a step beyond brand perception, YouGov then surveyed customers whose primary device is a smartphone and asked if they were likely to change carriers in the next six months. In the first quarter, only 11% of polled people said they would switch to T-Mobile. That number rose in the second quarter to 19% and has settled around 16% today. As for customers looking to switch to Verizon, that number fell from 24% last fall to just 11% in the current quarter. Of course the consistent moving and shaking of these numbers shows how inconsistent both the industry and customer perception of the brand within the industry can be. The popular choice today may not be the popular choice tomorrow. All in all, if we take the YouGov data at face value as it looks today, customers view Verizon a bit more favorably but are more willing to switch to T-Mobile. I’m sure that’s putting a smile on the face of T-Mobile CEO John Legere. Interesting article, I’m actually considering jumping back to verizon based on coverage and network speed. Verizon’s LTE network is not only slower than T-Mobile’s fully packed HSPA+ network, but also by far slower than their LTE network being deployed. T-Mobile is also the only carrier with ability to change to LTE-Advanced on a flip switch versus Verizon who will have to deploy the changes to get that going. Not to mention in those areas when LTE goes out (and it happens often on Verizon) you roll back to 1mbps EVDO – with T-Mobile you roll back to HSPA+ which is 15-20x faster, with peak 42x faster than Verizon. In 2011 when LTE was new Verizon would always have an outage. It sucked because I was on Evdo 2G. I had to manually dial a number to get 3G until LTE resumed. Speed..? LTE is faster on TMOB than on Verizon are you crazy? Not where I’m at. Speedtest shows some pretty dismal dl/ul speeds. My verizon friends get better coverage and speed. The challenge Tmo will have for some time is coverage areas. They are improving; but that takes time and customers are fickle creatures. I’m happy for now since 90% of my travel has 4G w/TMO, but sometimes it takes me to the little ‘o’ areas of GRS/EDGE..Rare no single..
Where i live Verizon has little to know coverage so T-MOBILE AND WIFI CALLING WORKS BEST FOR A much cheaper No contract price. 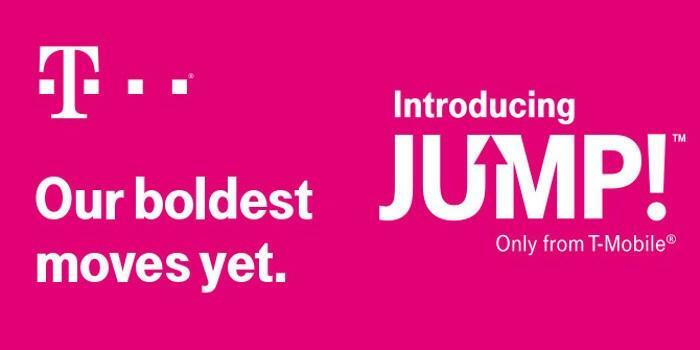 As you said earlier, you know no one considering T-Mobile, so why would you hear anything great about T-Mobile if no one you know has them or is considering them. In the last 3 years T-Mobile has majorly changed. They are no longer the underdog, and definitely have a better coverage area, price point and data speed than Sprint and Verizon. But I wouldnt expect you to know this because as you said, you dont know anyone with or considering T-Mobile, so you kinda are speaking out your bum. LMFAO,, I was about to say the same thing,,, Recently switching to TMOB a few months ago im sorry i didnt switch sooner. There are always exceptions. My mother’s home is one of them. I get better reception on my T-Mobile phone there than my AT&T phone. She lives between two T-Mobile towers (by less than a mile each way). Voice coverage is fine there, but I don’t remember much about the data speeds as I am on her Wi-fi network when I visit her. with no contact,but the would be stuck with using only 1 phone,over charges,only 3g. Glad I didn’t. Maybe you should get out more. Sounds like you just don’t know too many people. And, honestly, who gives a crap about people in the Apple stores. I bet all of your friends are on their parents plans too. Expand your horizan. I bet people in the Apple store are more towards selling IPhones for ATT and Verizon since it is linked to a higher price plan on data compared to TMobile and Sprint. Therefore, there is more of motivation to sell ATT and Verizon service over TMobile or Sprint. If you want bad service, you hear a lot more bad stories about sprint service. Sprint 3G data network is horribly slow compared to TMobile which makes it unusable. TMobile coverage while it isn’t perfect is still better than Sprint, now I wouldn’t go to say it is up to par with ATT and Verizon but they are taking steps to make coverage better. How long this will take I don’t know but it is progress. I carry a TMobile and ATT phone each provider has their weak spots. So as for you to say no one is considering TMobile, it all just depends on the area you are in. I think that that is true of most retailers. At best buy, they almost always try to sell you verizon and at & t in that order. Both carriers presumably pay a higher commission by charging customers higher rates, esp verizon. Verizon used this tactic to build up their network and increase subscribers at the same time. IMO, tmobile was caught napping by this strategy from verizon and it is probably the main reason for the increased subscribers for verizon BEFORE their network build out. I’m from Kansas City and used to drive to Minneapolis a lot for work, going through Iowa was the worst part of the trip because I would be roaming on att /Iowa wireless gprs/edge network. Granted roaming was free but speeds were…… Well you get the point. Drove through there not to long ago and what do you know, 4G for the better part of the trip! This just goes to show that Magenta is doing something about the gprs/edge network we just need to be a little more patient, I think it will be worth it! I second this. This little place in the Florida panhandle called Ebro once had no service. Zilch. Now, it has at least HSPA+ 21 or possibly 42. It is getting better…i never understood why Iowa coverage was so bad, Iowa wireless has things pretty well covered and they’re half owned by T-Mobile. Well im in vegas right now drove from los Angeles and to my surprise I had “4G” on my xperia z in a lot of places on the way there were like 5-6 months ago I had edge/gprs on tmobile I tought it was a phone glitch or something till I checked my daughter’s tmobile iPhone 5 she also had “4G” not lte but hspa of some sort . Did speed tests got 4-8 dwn, 1-2 up. So I was happy I was finally able to get driving directions and send pics were a few months ago I couldnt do any of those things so apparently tmobile is doing something. 4G hspa no LTE and I had the 4G icon (tmobiles version of xperia z dnt use H icon its either 4G or 4G lte I had 4G )most of the way there in the dessert etc.. Were before tmobile had only gprs not even edge I now had 4G and speeds where not that bad 5-6 mbps not the fastest but such an improvement over gprs which is great. I think this has to do with the metro pcs merger?? I dnt know if thats the reason it improved but I cant think of anything else because apparently tmobile is doing something about there spotty coverage and whatever they doing its working. were you using a t-mobile device when getting EDGE or an unlocked phone? Tmobile galaxy s3 back then I had edge now I get hspa . But used to get only Edge signal at home, and had to turn on Wi-Fi all the time. I recently noticed when Wi-Fi on my phone was off, 4G signal was still there. Speed test showed me about 2 Mbps Down 2Mbps Up. Not impressive numbers at all, but hey, it’s way better than Edge! Completely untrue. I live in a rural area and T-Mobile coverage is absolutely comparable to Verizon. You clearly didn’t read the article, as this study CLEARLY demonstrates that most Americans, regardless of terrestrial location, regard T-Mobile as a formidable competitor to Verizon (and rightly so, because it is). I’m sure you’d consider Sprint’s network to be better than T-Mobile’s (in terms of coverage), but again you’d be wrong because Sprint has the smallest native footprint of any carrier, especially in the LTE department. Lastly, Legere didn’t lie. He wasn’t “using Verizon’s spectrum in NYC to run speed tests at one of their events.” That’s not even possible. So, instead of lying and hating, go back to the Verizon forums. We don’t need you to stay here and continue to promulgate baseless, irrational falsehoods. Verizon cannot compete with the price nor the speed that T-Mobile has. People I’m around with always bag on T-Mobile saying that there coverage is bad and there downright bad. Then I get mad because T-Mobile in my perspective is the best carrier. They have what I need and there so nice when I go to the store. I got T-Mobile back in November 2012. Before that…I had Verizon for 9 yrs. and also before T-Mobile I never had a smartphone because it was way to expensive on Verizon. I didn’t even have Unlimited Texting. So for someone to say that T-Mobile is bad. Your sadly mistaken. They bag on T-Mobile’s coverage because it’s true. I love that I can use T-Mobile because of where I live, but break away from the metropolitan areas or veer off “main” corridors and you can say good bye to your signal a lot of the times. Look over to the VZ or even AT&T guy and they aren’t having any troubles. 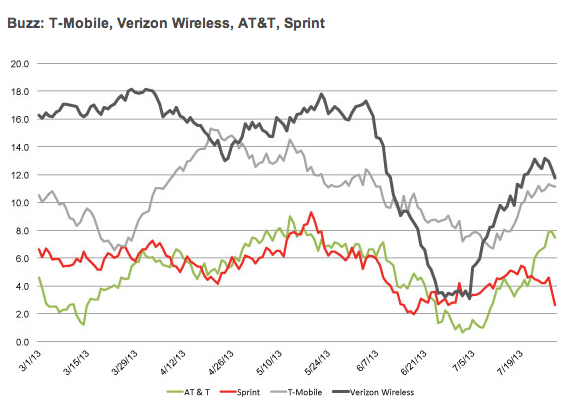 You can cherry pick examples that prove the opposite, but the trend is in favor of Verizon. I agree, as much as I love T-Mo, I took a road trip last week and was getting Edge in many places. But here in NYC it’s awesome (mostly). Verizon and T-Mobile aren’t even on the same playing field. I’m sure you can compare what works better here or there, but in my 4 years with T-Mobile, I’ve noticed they don’t do details very well. Sure, you can have the same general coverage, but sometimes details matter. The T-Mobile sites near me don’t even have backup power. All the Verizon sites have propane tanks and generators at them. You can be sure your Verizon bill is paying for that. I can hit a deadzone along a road and see Verizon already fixed it years ago, throwing down whatever it costs to fix it. So at the end of the day when you’re getting 30mbps on T-Mobile and 10mbps on Verizon, that’s all fine and dandy until their lack of detail bites you. This isn’t a complaint, just an observation. When you have 100 million customers paying $50/month more, you can spend money on details. There are places where the speed of Verizon Wireless and T-Mobile are equal with each other. My location (suburban MD) is one example of that. I live in Minneapolis, and the entire metro is blanketed in coverage, much of it LTE. And with very few exceptions, you have to travel quite far outside the metro area and away from the interstates to hit EDGE speeds. I’m just fine with not paying my carrier to install LTE to cover a bunch of farm fields like Verizon does. Minneapolis is just one example of the growing number of metro areas with pretty good T-Mo coverage. Many people spend a vast majority of their time within metro areas, and even though it’s super slow, EDGE is still data and allows for email checking and iMessage sending even in the farm fields. Perfectly fine balance for most, I would think. If EDGE works at it’s full potential it is barely passable. I frequently hit highways where I have full EDGE and it does not work at all. I can’t even get a page to load. EDGE isn’t as bad as it is made out to be. The real problem is that more and more, carriers are allocating less bandwidth to the EDGE network to use elsewhere. I have seen edge speeds between 90kbps up to almost 400 kbps. If it is slower than that, then there is severe congestion in the (EDGE) network due to the above reason. Even at 90 kbps, you have almost twice the speed of dial up modem, which people used for some time. EDGE isn’t aweful when it works at peak performance (~400 kbps). The problem is that I almost never see that. Most of the time it is more like ~50kbps with very flaky reliability. And then I hit the interstates of Georgia, where you get GPRS (2-3 Kbps). twice the speed of a dial-up modem. Welcome to 2001.
all you fan boys hate that tmobile is Winning..for one why are yall on tmonews if you have other network…i smell a bunch of haters roaming tmonews…why dont yall go on other sites to troll…im sick of all yall..lmao…..tmobile is shaking the ground and if y’all coming here to spam on tmonews than our CEO is doing his job. love you tmobile.. I know exactly how it works. But you know trolls will always troll . we pick link we click them not a search engine… you must be stuck n your parents basement or just want to start your own trolling..to each to their own..just leave the site if you are a T-Mobile hater we already have a handful. But the people polled were not “penny pinchers” or “people who value cost over quality.” This was marketing research using a representative sample of customers from a respected marketing firm. And therefore this shows that Legere’s branding is working. People always take cost into consideration, and many T-Mo customers could afford Verizon (myself included), but are completely satisfied with T-Mo and saving some serious money. You don’t have to be a “penny pincher” or “value cost over quality” to be happy with T-Mo. People value both. Other than T-Mobile, we see Sprint has been pretty quiet except Softbank and Clearwire merger. I was with T-Mobile for ten years until last fall, five of those years with an unlocked 2007 iPhone. When T-Mobile didn’t get the iPhone 5, I switched to Verizon. The people were professional at best and bureaucratic at worst. I surprised at the tinny-sound on Verizon–I’m convinced that CDMA must have more treble or something. Make a long story short, my Verizon iPhone was stolen and I used the opportunity to switch back to T-Mobile since they now have the iPhone. Very happy. Not going to do business with VZW, AT&T or Spring again. I switched because of sound quality, no contract, better service ( live in an major city), lack of bureaucracy and–get this–that there’s THIS VERY FORUM where T-Mo user talk passionately about their phones. I missed that there was no comparable independent VZW forum, although I guess one existed at one point. Happy to be back with T-Mo. I think verizon used to make sense for people who might travel, usually by road, often to less populated areas AND need good data connection. They can be traveling salespeople or plumbers on a job out of town. But increasingly people want to use their smart phones everywhere. Even a day’s inconvenience at the beach is not tolerable. If it were just the ability to make calls, you can do it on almost any network from anywhere because roaming is now free for calling across US. And the other poster is right- LTE does not carry voice yet and so verizon used the crappy CDMA for voice. On at & t and tmobile, you get to use HSPA for voice and the call quality is better. I personally don’t think use of a mobile service should be a status symbol or representing a class of humans. Plenty of very rich people do not drive million dollar cars and OTOH, there are people who live well beyond their means. I’d rather pay for unlimited everything including data services than to be nickled and dimed by AT&T, and Verizon. Granted Verizon has outstanding service, but them charging more to their already expensive plans when you exceed your data allowance. I get fantastic T-Mobile service in San Diego Metro, and in Miami-Dade. I have 5 lines paying only an average of $150 with T-Mobile. When LTE isn’t available, it falls back to HSPA+ they are both fast connections. Unlike Verizon and Sprint, you would have to deal with their dreadful slow 3G speeds when LTE is not available. Please note, I have had AT&T, Sprint, T-Mobile and Verizon. I speak out of experience. All i have to say is T-Mobile works where it counts. I’m ok with edge who needs 3G on route 66 and farm fields come on now. and wifi is literally everywhere. and with T-Mobile you get a larger base of GSM phones the VZ or Sprint. So i’m content. But hey there are other carriers! Well said bro!! You still have service to make a phone call, in case of emergency. However, who needs HSPA+/LTE in a farm road? The primary function of a phone is to place a call..you can still do that easily with GPRS. I dare to say in major metropolitan areas..Tmo covers you very well along with great speeds while taking account the price. I don’t have to worry about overages and paying 15 bucks per 1GB of data..do you realize what the profit margin is at that price? It literally takes pennies just to deliver that amount of data to a device and they dare to charge more than 1000 %? No, I am not exaggerating. I find that highly offensive and I would leave the company immediately..
i toally agree and then some,, im in Newark ,, NJ, and i have flawless speeds LTE and good 4g as well i havent looked back yet since i made the switch. FARMERS! And truckers, rednecks, cops, hunters…… the world doesn’t end at the city limits. Some of us feel that’s where it begins. Thats what radios are for. thats why police use radios to communicate. and Gps don’t need a lte/hspa/3g network to work. Rednecks account for 2% of America. and there are nearly no small time farmers left thanks to the government and capitalism. Technically the world does end after the city limits. you don’t see a new york city size hospital in the middle of a 10,000 people community? they have to travel to a city for proper health care support. living outside of a city makes thing inefficient especially health care coverage. but hey people dont care, they still build they homes in a wooded area. not my problem. Too bad they can’t challenge VZW in coverage! There 3g and faded 4g lte ..It was horriable great service at home then at work could use galaxy note 2 with 4g lte…Then I tried T-Mobile wow …what a relief it works at home and at work with 4g Lte in NYC …will never switch..never had speed like this .. I Love T-Mobile ! !